Owned and operated by one of the UK’s oldest family run shipping businesses. M.V. 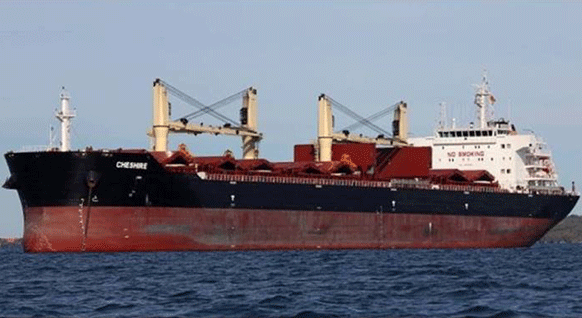 Cheshire is an unremarkable Supramax sized bulk carrier and was largely unheard of until she suffered an ammonium nitrate fertilizer cargo fire in August this year off the Canary Islands. 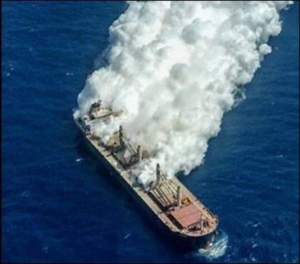 At the time of the fire, she was on passage from Norway to Thailand when her cargo began to overheat. 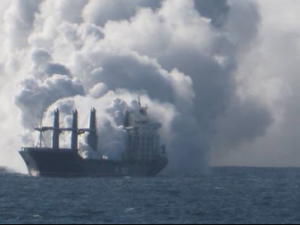 She continued to Las Palmas where she was scheduled to bunker but was denied access due the smouldering cargo. 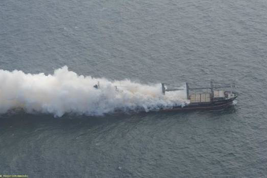 Crew members were evacuated by helicopter leaving salvage tugs to keep here offshore. With direct application of water ruled out due to the instability of the cargo, attending tugs were restricted to external water cooling. 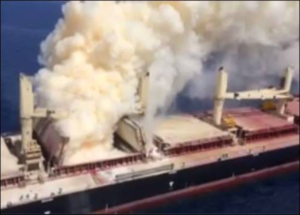 Heat transfer between cargo holds caused the fire to spread rapidly and high temperatures prevented salvors from boarding for two weeks until there was simply no ammonium nitrate left to burn. Only then were salvage crews from Resolve Marine, using four tugs directed from an operating base in Gibraltar, allowed to bring the vessel closer to the Canary Islands to enable direct access and support. More than a dozen other explosions involving ammonium nitrate have occurred over the past century. The deadliest occurred in 1947when a series of explosions shook the waterfront petrochemical complex at Texas City, southeast of Houston. 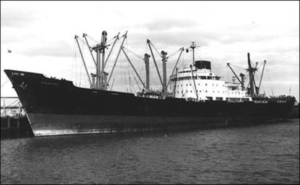 The French flagged Liberty ship Grandcamp carrying more than 2,000 tons of ammonium nitrate fertilizer exploded leaving 576 recorded deaths and 5,000 injured – the worst industrial accident in U.S. history. The pictures above taken in 2015 show a very similar incident to that of M.V. Cheshire but involving M.V. Purple Beach off the coast of Germany. 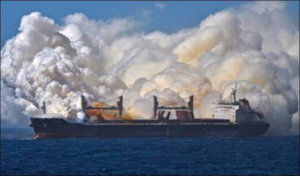 Ammonium nitrate based fertilizer is described as a Group C cargo in the International Maritime Solid Bulk Cargoes (ISMBC) Code. While subject to spontaneous combustion, ammonium nitrate is not, on its own, an explosive, but readily forms explosive mixtures with varying properties when combined with primary explosives. Founded in 1807 by the first John Bibby (1775–1840), Bibby Line Limited is the ship owning division of Bibby Line Group Limited; a diverse family owned business with over 200 years’ experience in a range of industries from retail, offshore, finance, distribution and shipping. It is one of the longest established family owned companies in the UK. The company has given the name Cheshire to several vessels including the 1927 built armed merchant cruiser seen above left during WWII, the 1959 built general cargo vessel, above centre and the 1989 gas carrier, above right. Company vessels are traditionally named after English counties ending with “shire”.